Finely chop the onion, carrot, celery and garlic. Place in a pan with rapeseed oil and sauté for 5 minutes over a medium heat. Add the lamb mince and break up well with a wooden spoon, cook until browned. Sprinkle in the flour and mix well, add tomato purée, stock, bay leaf, Worcestershire sauce and pepper, mix well, cover and simmer for 30 minutes, stirring from time to time. Peel the potatoes and cut into even-sized pieces, cover with hot water and simmer for 20 minutes. Drain when cooked, return to the pan and shake over a low heat to steam off excess moisture. Remove from the heat and crush with a potato masher until smooth, add hot milk, butter, salt & pepper, beat until well blended and fluffy. Remove the bay leaf from the meat and place the meat in an ovenproof dish. 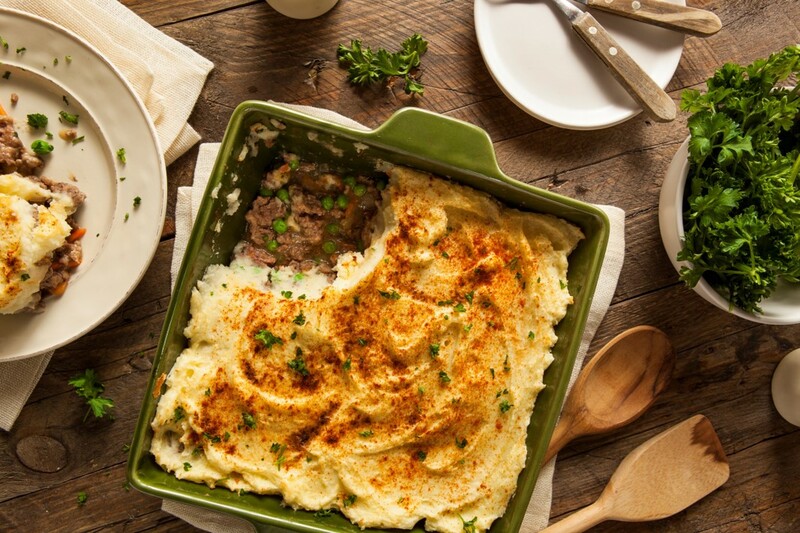 Carefully spoon the mashed potato onto the mix and use a fork to spread the potato over the top, sealing in the meat and making a stripy pattern. Place in the oven and bake for 30 minutes until top of the potato is golden.